The original NUCOG validation paper examined 265 patients with dementia, psychiatric and neurological disorders, and 82 controls.The NUCOG demonstrated high levels of reliability and face validity in this study, which was performed on an unselected cohort of patients from the Neuropsychiatry Unit. It demonstrated a superior capacity to differentiate dementia patients from controls, and to differentiate dementia subgroups, when compared to the MMSE. The ROC curve for the NUCOG, showing its performance at separating dementia patients from non-dementia individuals at cut-off scores of 80 and 83. The original NUCOG validation paper examined a mixed population of patients with a range of psychiatric disorders, neurological disorders, and dementia. Since this time, it has shown its validity in a number of populations. 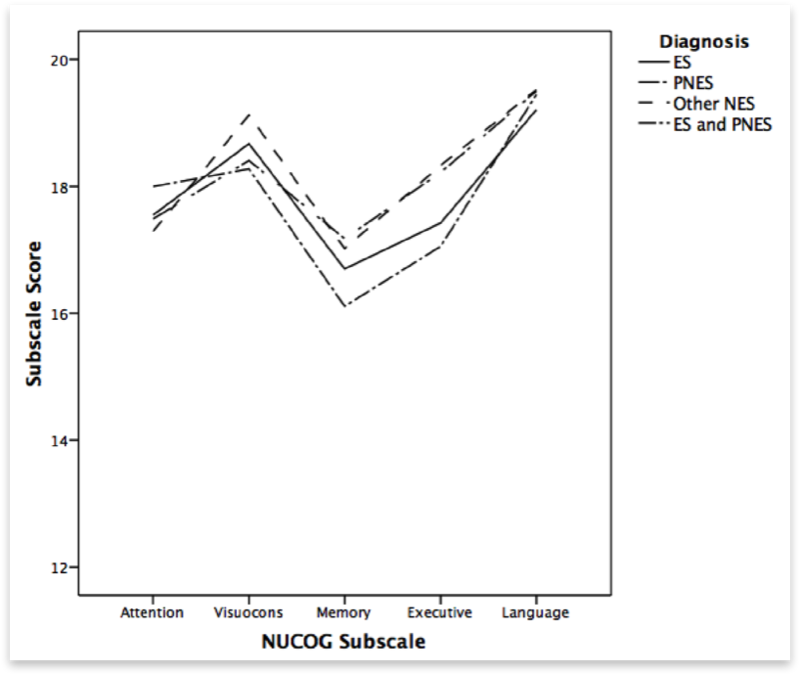 In epilepsy, we showed that NUCOG scores correlated strongly with performance on neuropsychological testing, and that patients with temporal lobe epilepsy performed more poorly on the memory sub scale than other epilepsy patients. This paper can be found here. Walterfang et al. Utility and validity of a brief cognitive assessment tool in patients with epileptic and non-epileptic seizures. Epilepsy Behav 21: 177-183, 2011. In a dementia neuroimaging analysis, we showed that patients with Alzheimer's disease scored consistently lower than patients with frontotemporal dementia in the NUCOG's memory and language sub scales. This paper can be found here. Looi et al. Differential putaminal morphology in Huntington's disease, frontotemporal dementia and Alzheimer's disease. Aust NZ J Psychiatry 46: 1145-1158, 2012. In Niemann-Pick type C disease we showed that hippocampal volume correlated with NUCOG memory scores. This paper can be found here. 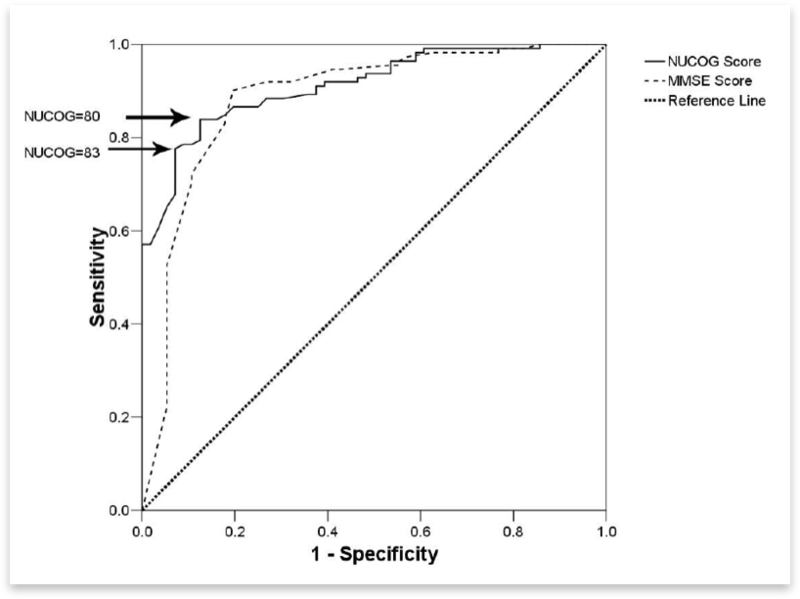 We have also shown that NUCOG scores correlate with ocular-motor biomarkers in this disorder, in this paper. Walterfang et al. Subcortical volumetric reductions in adult Niemann-Pick type C: a cross-sectional study. Am J Neuroradiol, in press. Abel et al. Saccadic eye movement characteristics in adult Niemann-Pick type C disease: relationships with disease severity and brain structural measures. PLoS One 7: e50947. The NUCOG has also been used in illness-characterising publications in neurogenetic disorders, including Fabry disease and adrenomyeloneuropathy. NUCOG scoring profiles across different epilepsy subtypes: epileptiform seizures, psychogenic non-epileptiform seizures, other non-epileptiform seizures, and a mixed seizure group.